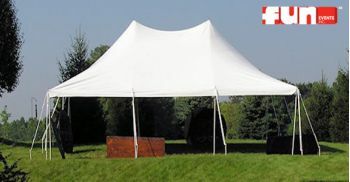 The 20 foot x 30 foot all white elite party tent is a white party tent to use for your backyard party tent, event, picnic, wedding party, or other fun party event. This party tent can seat up to 60 people at tables, 75 people with chairs only or cover 90 people standing. Also see our selection of tables, chairs or red and white stripe party tent for rental. Must be set-up on grass or asphalt as the tent is secured with stakes.